The red line indicates the median minimum extent of the ice cover for the period 1979–2000. This figure compares the Arctic sea ice extent in September for the years 1982 (the record maximum since 1979) and 2008. 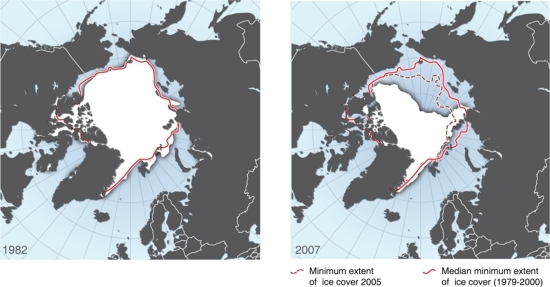 The ice extent was 7.5 million km2 in 1982 and only 5.6 million km2 in 2005 and down to 4.3 million km2 in 2007. As has been observed in other recent years, the retreat of the ice cover was particularly pronounced along the Eurasian coast. Indeed, the retreat was so pronounced that at the end of the summers of 2005 and 2007 the Northern Sea Route across the top of Eurasia was completely ice-free. Please note that this figure was not originally published in Global Outlook for Ice and Snow, but is updated from a figure in that publication.